Publisher Desc. 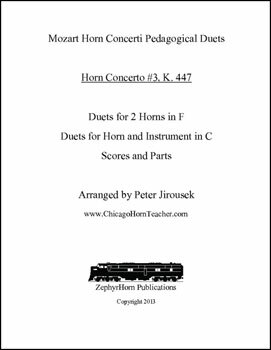 These pedagogical duets were developed to assist in the preparation of performance of the Mozart horn concertos. My piano skills being what they are I have invariably found myself singing along with students as they perform the solo in lessons singing the accompaniment in the rests and in a more deadly fashion singing along during the solo passages. For those of us that are better horn players than singers or pianists these duets may prove helpful. They should with the guidance of the instructor do the following: * Inspire more lyrical performing* Promote a clearer understanding of the accompaniment* Improve awareness of intonation* Offer new ideas for cadenzas* Give students a new method for performing the concertos without a piano accompanist Horn students oftentimes do not meet with an accompanist until a few weeks before a recital yet students WILL meet with you the teacher on a weekly basis. This opportunity of getting hornists engaged early on with the concerto as a whole not just the solo line is the key to greater musical success. While not originally intended for concert performance the duets should work very well in master classes and audition preparation. The C duet score and part were created for high-brass teachers and are especially great for trumpet players. The version in C is also handy to use on the piano as a single-line accompaniment.